I was so excited when I began this novel. I love the entire idea of Reapers and the addition of ancient Egypt seemed like a really original take on the idea. 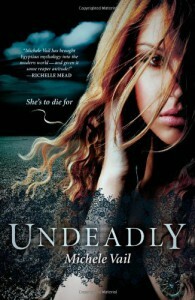 Not to mention the cover of Undeadly is gorgeous so I really expected to love this book. Unfortunately, it ended up falling flat right from the start. I knew this book was heading in the wrong direction when instead of careful world building Vail begins the book with vast information dumps. I wanted desperately to skip these sections but instead plowed on expecting a fuller and more in depth explanation later on. I never got this grand explanation and instead I was greeted by Molly, the main character, who was immature, flippant, and generally really bugged me. Molly has a dream on her 16th birthday about Anubis the ancient Egyptian god of the underworld. In this dream he asks if she will accept extra gifts from him. Molly accepts and then spends the rest of the book complaining about these gifts and not really learning anything about her new powers and what her purpose is. I think that was my main problem with this book. There was no clear goal or plot direction. There are a ton of different possible story lines and in the end only one of them is resolved leaving all the others never explained or even explored. I was disappointed with the direction the book took. Molly as a character got on my nerves. I understand that she is 16 and is entitled to being a little immature, but she takes immature to a whole new level. 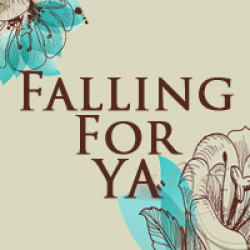 Molly can not do anything herself, believes everyone at face value, and just kind of dances through life with no deeper thoughts then the mall and boys (even when people tell her she needs to think of something else). I initially though Molly was portrayed this way in the beginning of the novel so that we could see her growth as she comes to terms with Anubis’s gifts. The problem was she never did any growing. She acts this way the entire novel which takes place in a week! My other problem was that the one character, Rath, I thought might be able to make her grow up and see the importance of her new position disappears half way through the novel with no explanation and shows up toward the end offering some secretive answer about where he has been. I know if someone disappeared for a week I would not put up with the “Working for Anubis, can’t tell you its secret” answer. Multiple characters offered this as an excuse throughout the novel and it just did not jive with me. I was also disappointed with the supporting characters. After a big surprise in her life and the Anubis dream Molly chooses to go to an elite boarding school, Nekyia. Her first day she meets a mean girl who instantly hates her for absolutely no reason. Molly then makes best friends with the first girl she sees. This portion of the story reminded me a lot of the House of Night series. That was not good and had me cringing. The mean girl (Aphrodite) who happens to be in charge of an elite club is never given a good reason for her dislike of Molly. And this new best friend, who also happens to be Southern and gorgeous (Stevie Rae) doesn’t really have a personality. I felt like she was just there to fill space. I actually felt this way about all of Molly’s Nekyia friends. Overall, this book was just not my thing. The world building was not done well, the characters felt too young and immature, and there were far to many plot holes for me to enjoy the story. I am going to save myself the time and skip the next book but for those of you who enjoyed The House of Night series by PC and Kristin Cast or Evermore series by Alyson Noel you might enjoy this one and should think about giving it a try.